The Microsoft Worldwide Partner Conference (WPC) brings together over 15,000 attendees from around the globe for a week of networking and learning—all with the goal of increasing partner profitability and accelerating business growth by discovering new business opportunities. 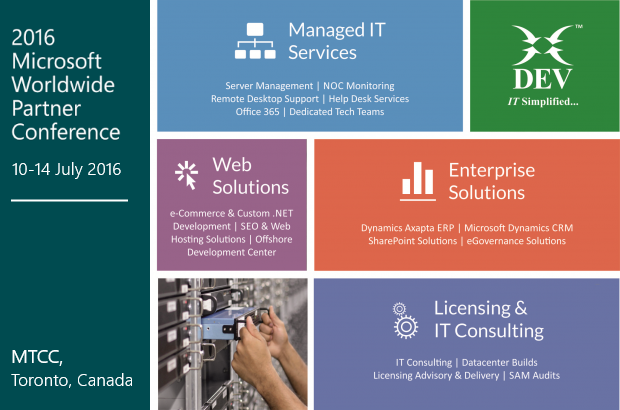 In July 2016, the Microsoft World Partner Conference will bring the partner community to beautiful Toronto, Canada. Meet the DEV IT team from July 10 – 14 at Metro Toronto Convention Centre (MTCC) and learn about how DEV IT’s Cloud Solutions & Services, Managed IT Services, MS Dynamics ERP & CRM Solutions, MS SharePoint Solutions can help to optimize your IT and software applications investment within your business. Offering full spectrum of Remote Infrastructure Management service assuring peace of mind. Choose from a range of our managed IT service portfolio which are custom built for your business and can scale to your business needs. With our managed services, we can enhance your IT experience, and provide value to your business. Your technical support challenges will be handled competently and efficiently; allowing focusing your valuable time on managing your business. Our managed services ensure proactive monitoring, increased first time resolution and reduction in average response times. This in turn improves end user satisfaction, thus adding value to your IT. Hire dedicated resources to build your own multi-technology proficient team of skilled manpower. Our ODC houses team of talented developers who use methodologies, processes, tools and technology to cater each clients’ specific business needs. This serves as an offshore extended arm of your business which reduces significant costs and lowers management headaches. Offering industry specific custom ERP and CRM solutions implemented on premise, hybrid or in the cloud. Microsoft Dynamics AX is a comprehensive ERP platform that is geared to help you connect with global customers, business partners and subsidiaries via standardized, automated and streamlined business processes, in a way that ensures success. That combined with vast experience and exposure of our team, you are sure to get all the benefits of a tier 1 ERP solution. We are a cloud facilitators & we specialize in providing your business with the technology support it needs. Our cloud expert team handles every aspect of your cloud solution to meet your unique workload requirements. Right from the initial design and sizing to deployment, from the migration to post-migration support and proactive managed services, our cloud technologists make it a truly no-hassle experience thus preventing potential problems before they arise, ultimately leading to a reliable, worry-free cloud environment.